Melt the butter in a Dutch oven over medium-high heat. Cook the onions, celery and garlic until soft and translucent, 5 minutes or so. Add the flour and cook for another minute, whisking until well blended. Add the chicken broth milk and cream, stirring until smooth. Increase the heat and bring it to a simmer. Reduce the heat to medium, add the remaining ingredients, and simmer uncovered for 15 minutes. Serve with a CADILLAC (Parmesan Roast Beef) or grilled cheese sandwich. YUMMY!! NOTE: This recipe is roughly equivalent to two cans of prepared canned condensed cream of celery soup. 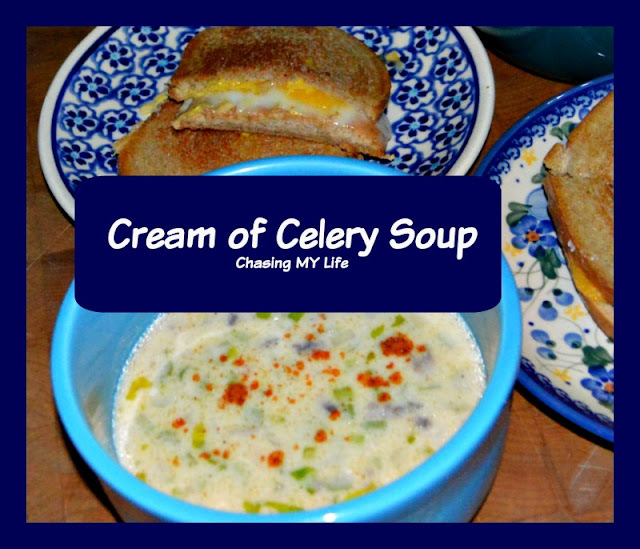 You can enjoy it as a stand-alone soup with a grilled cheese sandwich or use it in any recipe calling for prepared canned condensed cream of celery soup. If using as a base for other recipes, soup will keep in the refrigerator for a few days.